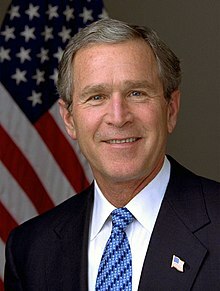 George Walker Bush (genys 6 mis Gortheren, 1946) yw politeger ha negysydh, neb a sodhas avel 43a Lewydh Statys Unys a 2001 dhe 2009. Mab yw an 41a Lywydh, George H. W. Bush. Kyns bos Lewydh, y sodhas ev avel Governyer Teksas a 1995 dhe 2000. Y teu ha bos lewydh wosa fetha ombrofyer Parti Demokratek, Al Gore. Mar ogas o an sewyans bys mayth o res bos dasnivera sewyans nebes kontethow yn Florida, dell via y sewyans a ervirsa an etholans dien. Nyns o sewyans an etholans ervirys bys yn 12 mis Kevardhu, mayth erghis Breuslys Ughella Florida dasniverans may teklaryas bos Bush sewen. Termyn nessa a waynyas yn etholans lewydhek 2004. Wosa eth mis bos lewydh, an omsettyans 11ves a vis Gwynngala a hwarva. Yn sewyans Bush a lonchyas Bresel orth Browagh. An kaskergh keswlasek a dhallathas gans goryskynnans Afghanistan a godhas y governans Taliban, ha bresel yn Irak a dhomhwelis Saddam Hussein. Ynwedh, ev a avonyas policiow erbyseth, yeghes, reyth 'Flogh Vyth Gesys Dhelergh' (No Child Left Behind), reyth PATRIOT. Amendyans Gwithans Demedhyans a avonsya, mes nyns o sewen. Diwettha chanj an folen ma a veu an 16 Est 2018, dhe 06:08.